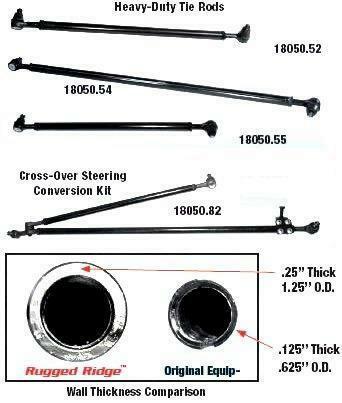 Beef up your ride with Rugged Ridge steering components. This is a bolt-on solution for preventing bent tie rods from wheeling with larger tires. The tubes are 1-1/4 inch ID steel that is cold rolled, pierced, and drawn through dies to produce a 1/4 in. wall thickness. This is true DOM tubing with NO seams OR welds to fail.